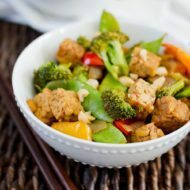 When I started cooking with tempeh, I had the hardest time getting it to taste good — it always had this funky, bitter aftertaste. I tried everything — the pre-boiling method, marinating for hours, etc. I almost gave up on cooking it at home. Then I realized that there are different varieties and some have a milder taste than others. So far I’ve found that LightLife’s Three Grain is the mildest and tastes the best to me. And, I’ve grown to really like it! So much so, I can now eat it plain on a salad or in a collard wrap or straight from the package (although that’s not my top choice). Tempeh is a great plant-based protein. It contains cooked soybeans (think edamame) that have been fermented, which binds the soybeans into a cake/patty. It’s similar to tofu, however there are some differences – tempeh is less processed, has a stronger flavor and has a bit more texture. 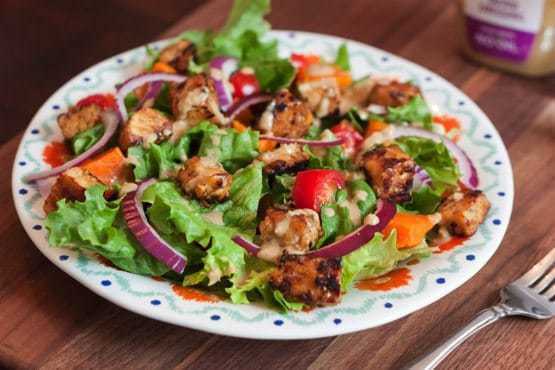 Inspired by one of my favorite tempeh recipes (Orange Pan-Glazed Tempeh from 101 Cookbooks), I decided to come up with a quick and easy tempeh recipe with lemon and maple syrup to use for topping salads. Didn’t mean to get off on a tangent, but the point is that sometimes I do crave a little crunch factor on my salads that nuts, carrots and the brunt edges of roasted veggies just can’t provide, so I thought I’d experiment with making a crispy tempeh crouton of sorts. It worked! These little cubes have a lovely lemon maple flavor and the crisp texture I was going for. 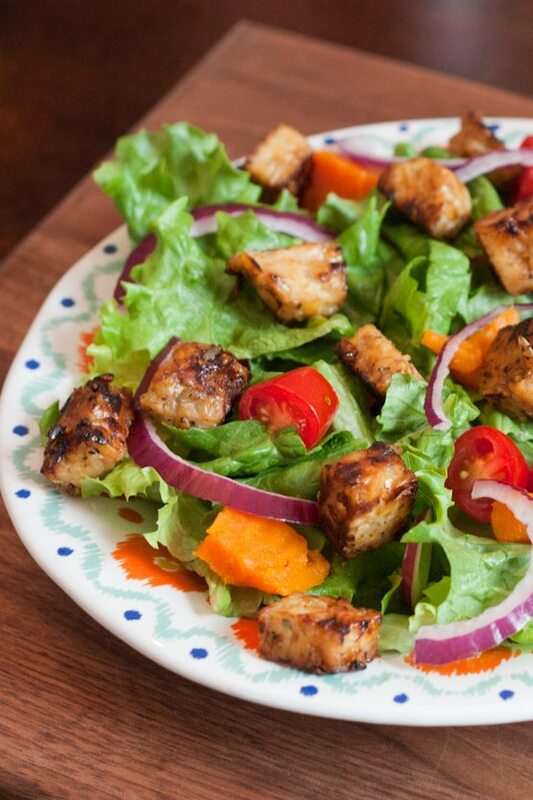 These tempeh cubes are great for snacking or as a topping on salads. If you’re watching your sodium intake, you can omit the tamari. And if you’re in a rush it’s fine to step the baking step — it just crisps up the tempeh a bit more. Heat oven to 400°. Chop your block of tempeh into bite size squares. Heat coconut oil in a non-stick skillet on medium-high heat. Once melted and hot, add tempeh and cook for 2-4 minutes on one side or until the tempeh turns a golden brown color on the bottom. Flip the pieces of tempeh and cook for another 2-4 minutes. While tempeh is browning, mix together the lemon juice, maple syrup, tamari, water, basil, garlic, and black pepper. Pour mixture over tempeh and stir around to coat the tempeh. Sauté for 2-3 minutes, then flip the tempeh and sauté another 1-2 minutes. The tempeh should be nice and brown on both sides. The tempeh is ready to serve after sautéing, but if you want to the pieces a bit more crunchy, place on a baking sheet and bake for 15-20 minutes in the oven. Remove from the oven, plate and serve. I could eat this tempeh plain with a side of veggies or as a snack — I almost ate half the batch for a snack, straight from the fridge one afternoon. That said, I think it’s amazing as a topping for salads. 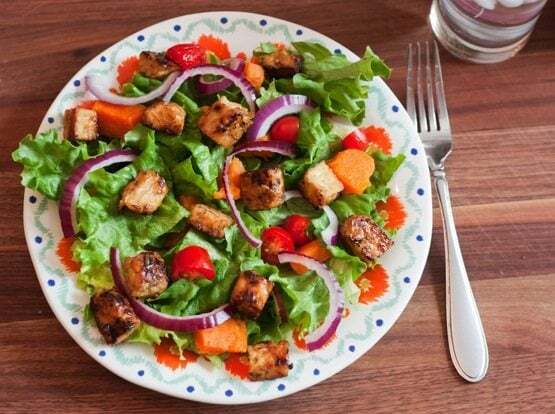 For my salad I used fresh chopped romaine, red onion slices, grape tomatoes, baked sweet potato chunks and Zesty Tahini Dressing from Whole Foods. 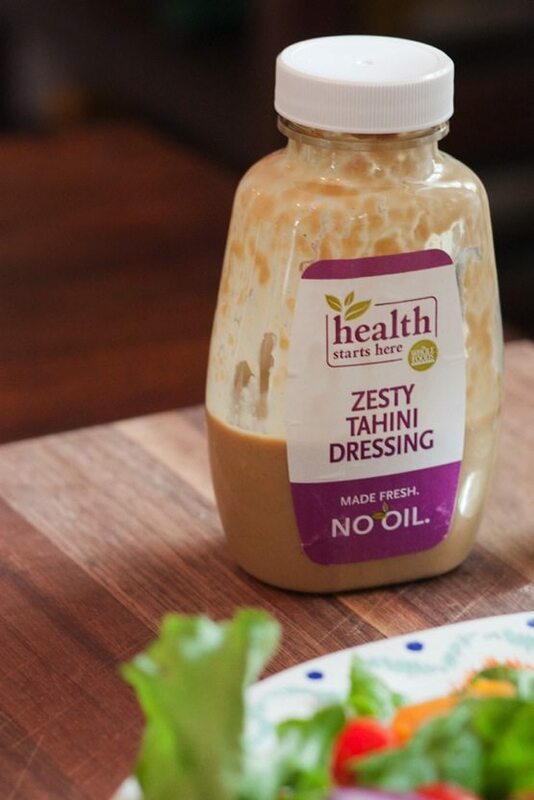 I love this dressing and buy it often out of convenience, but you could easily make your own (it’s similar to the dressing I use on my Garlicky Kale Salad). This combo worked really well together. So delicious! Do you like tempeh? What’s your favorite tempeh recipe? 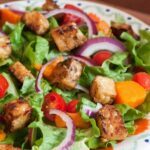 I’m always looking for new tempeh ideas! Thanks so much Lauren. I almost completely forgot about tempeh bacon — it’s delicious too! 🙂 Thanks for pinning. This looks like a great recipe! I have a package of tempeh from Trader Joe’s sitting in my fridge right now. Going to try this out! Awesome. Let me know what you think if you do try it Lauren. This sounds fantastic!! I am always looking for new ways to prep tempeh. It is my favorite meat alternative! Always looking for new ways to eat tempeh! (There’s a block in my fridge right now) This looks great, Britt! I LOVE that salad dressing so so so so much. I always have a bottle of it in the fridge 🙂 It’s always nice to have an idea for a salad topper so I might try this! 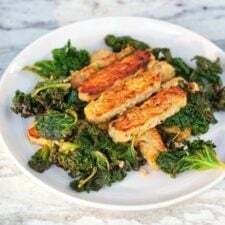 Check out my glazed tempeh recipe on the Tempeh girls Facebook page. We produced Betsy’s Tempeh in Mich. for 9 1/2 years in the mid 80’s so I have developed some interesting recipes for this great food. We developed a new process for making tempeh on stainless steel trays so we could customize our tempeh for special occasions like cutting the tempeh in hearts for a Mich. heart race, etc. 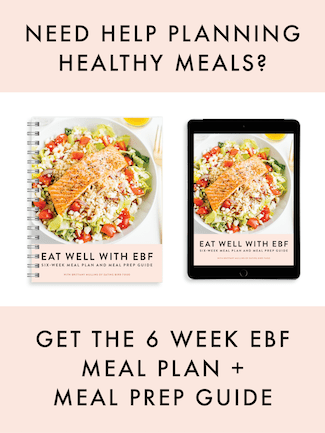 Since retiring, we set up our website showing our easy method for making the best tempeh at home. Feel free to write with any questions/comments. We recently filed a patent for a tempeh incubator that could be used in restaurants or small shops making artisan tempeh for the local community. That looks really good! 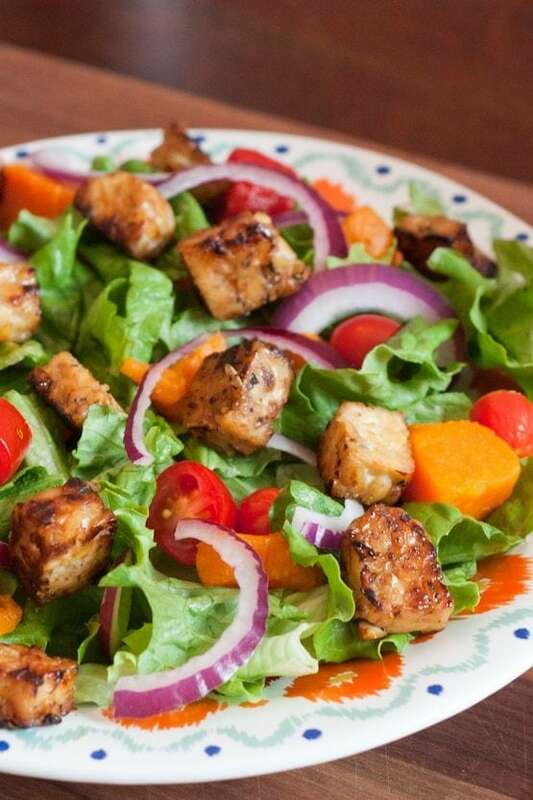 I am not a fan of salad but I am willing to try this out. The fact that it has maple syrup intrigues me haha. Great post. 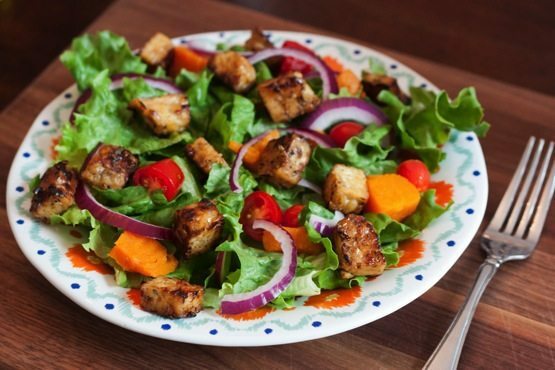 Tempeh looks beautiful in your colorful salad! It’s funny, years ago I had a tempeh dish that was one of my favorite things of all time. Ever since I’ve been trying to replicate it to no avail- my tempeh always had an off flavor I just couldn’t get past. That is until last week I found another store in town that sells a brand I’ve never tried before. I decided to give it a chance and my God, I could eat it straight from the package it’s so much better!!! Now the reason this is funny: lightlife is the brand that had the off taste all these years, Yves is the brand I finally just tried and love!! I guess everyone has slightly different tastes! Ha!